uuid : 2cd609cd-730e-4b87-9f81-5d75f9c74a2f templates_id: 119530 templates_uuid: "86beaa27-8b4d-471f-8cee-28021520f269" title: "Invoice Template - Free Invoice Template - Create an Invoice Template" display_name: "Invoice" meta_keywords: "Bill" description: "
Outline the necessary payment details if you sell a customer a product or service with this invoice template. 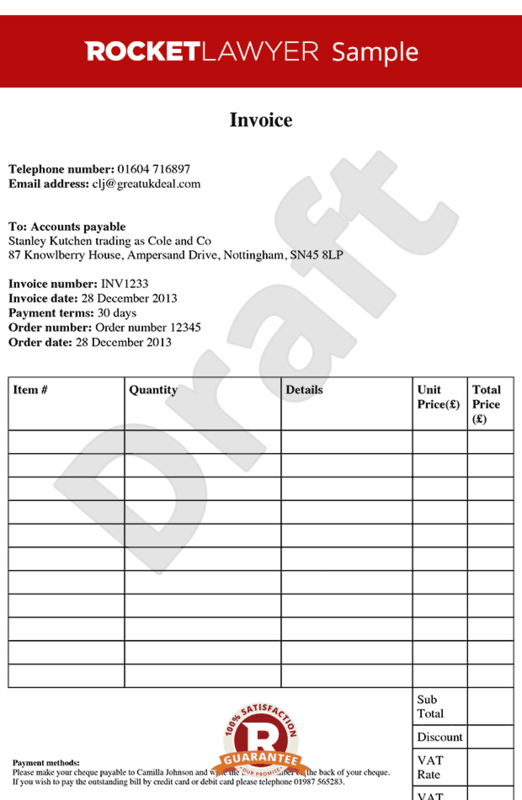 As a seller you will need this invoice template to send a bill or fee note to a purchaser. Alternatively you can use it to sell goods or services to a purchaser. This invoice covers the goods or services to be sold or purchased, the price and payment terms, as well as VAT details, if necessary. This invoice template will calculate the sub total, discount, vat and purchase total automatically for you. An invoice is essentially a bill submitted by a business to its customers or clients in respect of goods supplied or services rendered. It\302\222s a crucial part of the business transaction and also serves as a record for tax purposes. Invoices generally include details of both businesses involved in the transaction - and often consumers (particularly in e-commerce transactions) - as well as a description of goods and services provided, individual costs and a total amount to be paid. An invoice should not be confused with a receipt - which is an acknowledgement of payment. All VAT registered businesses are legally required to submit invoices to any clients who are also VAT registered. However, it is good practice for all businesses to generate invoices as part of the overall transaction process, irrespective of their VAT status. Furthermore, most business clients will only pay for goods or services once they have received an invoice, so ensuring that invoices are processed in a timely fashion facilitates payment and avoids discrepancies and delays. Keeping an accurate record of invoices is also crucial for annual tax returns, in terms of calculating business turnover, profit and expenses. A purchase order number (if required by your client). VAT invoices should be used where both businesses involved in the transaction are VAT registered. See the GOV.UK website for information on VAT invoices. You should ideally negotiate payment terms with your client prior to sending an invoice. However, an invoice can include a reminder of the payment period agreed, or a preferred payment period if one was not discussed. Many small businesses require payment within 14 calendar days but larger organisations may agree to up to 60 days (or longer if reasonable to both businesses). If no specific payment period is agreed, clients must pay within 30 calendar days of receipt of the invoice, and 30 days is generally considered to be the standard payment period amongst businesses. What payment methods can I set out in an invoice? Most businesses pay by direct bank transfer, so you should remember to include your bank account name, sort code and account number in any invoices. Alternatively, you can ask to be paid by cheque - in which case you should specify the best postal address. Some businesses also offer the option of card payment; however, note that this will often incur a processing charge and there are rules on passing on these processing fees.
" created_timestamp: "2018-10-08 04:36:41.0" modified_timestamp: "2018-10-08 04:36:41.0" active: true created_by: 157 modified_by: 157 dcm_id: 278 url_slug: "Invoice-template" meta_description: "Create an invoice template with simple guidance from Rocket Lawyer. Use this invoice either as a seller to send a bill to a purchaser or to sell goods or services to a purchaser. Try this free invoice template." time_to_complete: "10 minutes"
An invoice is essentially a bill submitted by a business to its customers or clients in respect of goods supplied or services rendered. Its a crucial part of the business transaction and also serves as a record for tax purposes. Invoices generally include details of both businesses involved in the transaction - and often consumers (particularly in e-commerce transactions) - as well as a description of goods and services provided, individual costs and a total amount to be paid. More than just a Invoice template, our step-by-step interview and guidance makes it easy to create your document. Easily create online, download, print and sign your free Invoice in minutes. This document is also sometimes called: Bill.